Now that you have ready Part 1 and have an understanding of how the body creates energy it is time to look at how you can tailor your training sessions to make these energy systems stronger...so that you can do all of your favourite things faster, longer and without as much fatigue! Enter...Zone Training. The purpose of Zone Training is to make the most efficient use of your training time by ensuring you are training the correct energy system at the right intensity and dose. Zones are different levels of intensity and can be created based on heart rate, pace, power (bike) or perceived exertion. Zone training will ensure that you are training with a purpose during each and every workout and getting the most bang for your training buck. Numbers and watches and gadgets and gizmos can be very helpful tools for your training toolbox. When following accurate zones, training with pace, power or heart rate can help you stay at the correct intensity for the correct length of time, thereby helping you train the correct energy system for that workout. Numbers, however, can never be fully relied upon, as they are static, while you are a dynamic being. Heart rate is very finicky and can be effected by fatigue, stress, caffeine, illness and more. Pace zones can be meaningless when training on technical, undulating or mountainous terrain. All zones can quickly become outdated as our training adaptations kick in, making us faster and stronger than our zones give us credit for. Frequent zone testing sessions will minimize these errors, but they will always be part of the mix. This is why learning to train with perceived exertion and honing your intuitive training ability is extremely important. Learning your bodies signs and signals is the key to dynamic and effective intensity training. Intuitive training can take time to master, however, so using zone training can be a great way to help us learn what it 'feels like' when we are training at or close to each zone. By using a HR monitor or GPS for pace, you can reflect on your perceived exertion and use these tools together to help you become a more intuitive athlete. Training too hard during low intensity, aerobic workouts. Not training hard enough, during high intensity, anaerobic interval workouts. You will remember from the Energy Systems post, that in order to transform your bodies aerobic energy system (for all events lasting more than 2.5 hours this is critical), you must train at a low enough intensity to stay below the aerobic threshold. Most athletes push above this threshold (darn ego!) and they never reap the amazing benefits of aerobic training. Same goes for those Anaerobic threshold workouts- most athletes don't push hard enough to get up to the lactate threshold and never realize the potential from these powerful workouts. 1. Blood Lactate Testing: the gold standard. This is the big daddy of zone prediction. All other tests are measured against this method which takes actual lactate readings from your blood to calculate your training zones. 2. Lactate Threshold field tests. Completing a LT field test, following specific protocols, can be very accurate. The pro's are you can do them on your own anytime with little or no equipment. The con's are ensuring you are able to push yourself hard enough to find your true LT.
After a 15-20 minute warm up, complete a 30 minute time trial on a flat course, track or treadmill set to 1.5% incline (running) or on an indoor trainer with set gearing (biking). Go as far as possible in 30 minutes. After the first 10 minutes, start your heart rate monitor/select a new lap. Record the Average Heart Rate for the final 20 minutes of the Time Trial (TT). This is your Lactate Threshold Heart Rate (LTHR). Record your 30 minute TT distance to determine your pace per km and to compare over time. Cool down for at least 10 minutes at an easy pace. One you have your LT data you can calculate your own 5 Zones using the following percentages of your LT heart rate and pace. You can use this chart or the ELM Training Zone Calculator to determine your 5 Training Zones for HR and Pace. Training Zones are calculated based on percentages of your Lactate Threshold Heart Rate or Pace (or Power for those using power meters on the bike). Some methods use 5 zones and others use 6 or 7 which break down the zones further. Your zones change over time and are a result of your genetics and your training program. It is important to complete LT testing on a regular basis, every 6-10 weeks, to ensure your zones are current. When training with Zones, always use RPE to set the intensity first, and use HR and pace in combination with this- don't be a slave to the numbers. Learn to listen to your body and train at the correct intensity based on how you are feeling. ZONE 1: Aerobic. Feels like a 4-5/10 RPE. The lower level of this zone is used for base aerobic training and recovery and feels very easy. The upper level of this zone is for improving aerobic endurance and increasing the Aerobic Threshold (AT). When you train just below this point you will develop your aerobic endurance base most effectively. It feels comfortable and conversations are possible. By training at this zone you will increase your Aerobic Threshold and improve your performance in events lasting 2 hours and beyond. LSD long slow duration pace 30-90mins+. Should feel VERY easy. No deep breathing, no burning legs. Slow down if you are unsure. Be conservative! Better to be too low than too high and miss out on the Z1 benefits. ZONE 2: Tempo. Feels like a 6-7/10 RPE. Some call this the junk zone- but not if you are training for middle distance events. You aren't getting pure aerobic OR anaerobic benefits in this zone BUT you are training for the specific demands of events lasting approximately 2 hours. Pace and breathing is moderate, a bit harder to hold a conversation. ZONE 3: Lactate Threshold. Feels like a 7.5-8.5/10 RPE. The lower level of this zone is known as ‘sub threshold’ and feels as if you are reaching a one hour all out pace. The upper level of this zone is known as ‘super threshold’ and feels moderately uncomfortable, with some mental focus required. When you train within this zone you will bump up your Lactate/Anaerobic Threshold and increase your ability to sustain a faster endurance pace without becoming fatigued. Training this threshold is often the key to improving performance in events lasting 1-3 hours. Z3 training can be done as 'Steady State' (begin with 5minutes and build to 30) or ‘Over Under’ intervals of working at the top of this zone (supra threshold) and then at the bottom (sub threshold) for a series of work:recovery intervals. Hard pace. Very challenging. Heavy, but controlled breathing. Burning legs at the top of this zone. Be aggressive! ZONE 4: Feels like 9-9.5/10 RPE. Pace will be very hard but sustainable for 15-30 minutes at the lower level of this zone. Train to improve Aerobic Capacity (VO2max) at the very top of this zone with intervals of 1- 6 minutes. *Note: Heart Rates are not an accurate way to monitor intensity in this training zone as the heart rate will not have time to raise to the zone level. ZONE 5: Maximal exertion and Anaerobic Capacity/Power Training. Feels like 9.5-10/10 RPE. Your max speed not only determines how you perform at events lasting 2-5 minutes long BUT IT ALSO can limit your other 2 thresholds- aerobic and anaerobic by squishing up all your zones. Train this zone with maximum speed intervals lasting 30s-2 minutes tops. Accelerate for 30s-2 minutes, recording the distance traveled. Recover with double the time then repeat trying to match your original distance covered. Start with 4 or 5 repeats and build up to 10 over time. If you can do more than 10 you are not working nearly hard enough. *Note: Heart Rates are not an accurate way to monitor intensity in this training zone as the heart rate will not have time to raise to the zone level. Looking for a Training Plan to put those training zones to work for? Check out my Self Directed Training Plans over on the ELM site or join me in my Online Coaching Group, Team ELM Online! Train smart and have fun! I love to play in the woods and climb to the top of things! Living wild on Van Isle. Coach online and in-person at www.elmhealth.com. Dreamer, explorer, writer, photographer. I am lucky to 'play' all day as a Coach and Kinesiologist with my business, ELM! 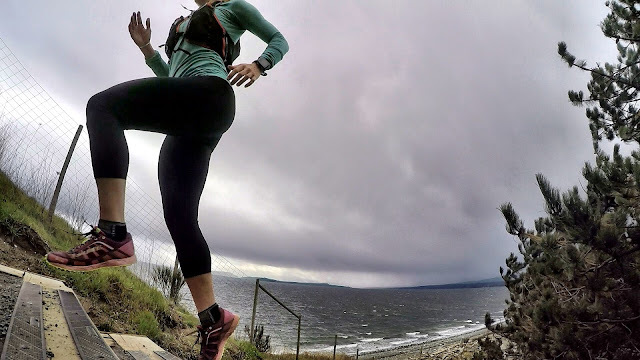 ELM offers Fun Fitness Adventures in the Comox Valley on Vancouver Island, B.C. and around the Globe! Online Strength & Endurance Coaching, Trail Running, Fitness Bootcamp, Adventure Racing, Kinesiology, Lifestyle Management, Personal Training...and more! Learn to Run...or Start Again! Sarah Seads. Watermark theme. Powered by Blogger.